WASHINGTON — D.C. Mayor Muriel Bowser says she will introduce emergency legislation that she says would allow federal employees who live in D.C. and who have been working without pay during the partial government shutdown to file for unemployment benefits. Still, legal experts say the move is a violation of federal regulations. “How the federal government decides to enforce that is anyone’s guess,” said Debra D’Agostino, founding partner of the Federal Practice Group, which specializes in federal employment issues. D.C. is not alone in bucking the federal government’s guidance. Last week, California Democratic Gov. Gavin Newsom said his state would also offer unemployment benefits to all federal employees affected by the shutdown. D’Agostino said she didn’t think it was likely the federal government would haul D.C. or California into court over the matter, not least because of the optics. “How hard can you push for border patrol to not get paid when you’re saying there’s a crisis at the border?” she said. In addition, any federal employees receiving unemployment during the shutdown will have to repay those benefits because Congress and the president have already signed off on back pay for all federal employees covering the duration of the shutdown. “It’s not like these federal employees are going to be robbing these states of their unemployment funds,” D’Agostino said.Speaking at the D.C. news conference, Unique Morris-Hughes, the director of the D.C. Department of Employment Services, said her office doesn’t yet have estimates for how much the District expects to shell out on unemployment benefits for “essential” workers. She expects several thousand federal employees to sign up. As of Jan. 14, more than 7,000 federal employees and contractors in the D.C. area had already applied for unemployment since the shutdown began, according to Bowser’s office. The benefits are being paid out through the District’s Unemployment Trust Fund, which contains money from payroll taxes. At the same news conference, Bowser also announced an additional $2 million in local funds to shore up Supplemental Nutrition Assistance Program benefits, also known as food stamps, for new customers and customers who need to recertify their eligibility during the shutdown. “This $2 million in local funds will allow DHS to provide SNAP benefits to those families because we’re not certain when the federal funds will continue to flow for them, Bowser said. The shutdown, which has now stretched to 32 days, is denting D.C.’s fiscal outlook, the mayor said. “We will have to plan for tens of millions of dollars of losses because of this unnecessary shutdown,” she said. D.C. Del. Eleanor Holmes Norton said the out-of-work federal employees could have a ripple effect through D.C.’s economy. 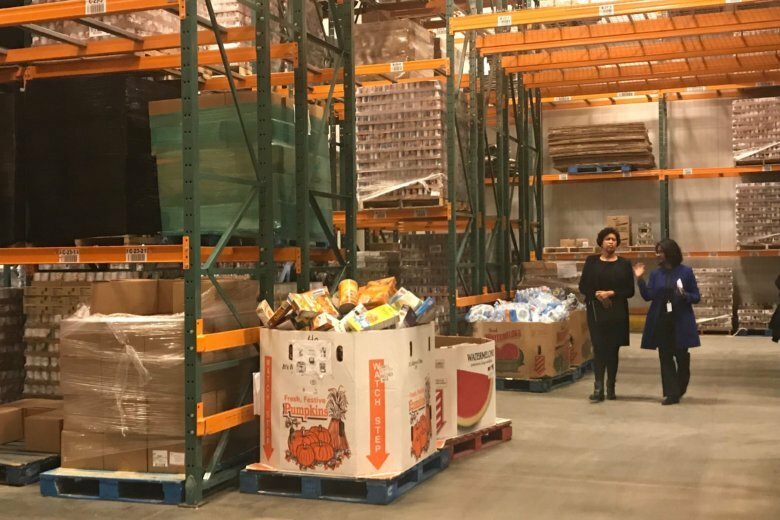 The news conference took place at the Capital Area Food Bank in Northeast D.C..
Radha Muthiah, the food bank’s president and CEO, said her organization serves about 3 million meals in a typical January. She projects the food bank will hand out about 3.6 million meals this month — a 20 percent increase.